The flooring in commercial kitchens is subjected to some of the harshest daily punishment, from exposure to hot oil splatter and extreme temperature changes, to continuously moist conditions, dropped metal pans and ongoing foot and cart traffic. Additionally, commercial kitchens are some of the most regulated of all industrial environments and the flooring is regularly scrutinized by visiting health inspectors. With the recent uptick in food borne illnesses, the role of commercial kitchen flooring in helping to sustain good sanitation has become more important than ever. Maintaining a hygienic, USDA compliant environment should be priority number one in every food facility, not only because it is a primary focus of visiting inspectors, but most importantly, because a breach in food safety protocol can seriously impact the health of workers and guests. Unfortunately, many tiled and grouted flooring systems have creases, seams and numerous places where food particles and liquids can get stuck, inviting microbial proliferation. Once these substances get embedded or absorbed into and under the floor surface, it can become nearly impossible to eradicate the hidden germs and mold, along with the development of unpleasant, telltale odors. In contrast, a virtually seamless traffic surface with an integral floor-to-wall cove base can help eliminate the crevices in which pathogens tend to hide and breed. This type of floor has a monolithic surface that is far easier to keep clean. Proper slope towards the floor drain is also needed to help minimize areas of puddling and pooling in which microbes can grow; some food facility flooring systems can be used to correct the slope during installation. Spillage of water, cooking oils, and other liquids are frequent occurrences in commercial kitchens, creating potential slip-and-fall hazards. 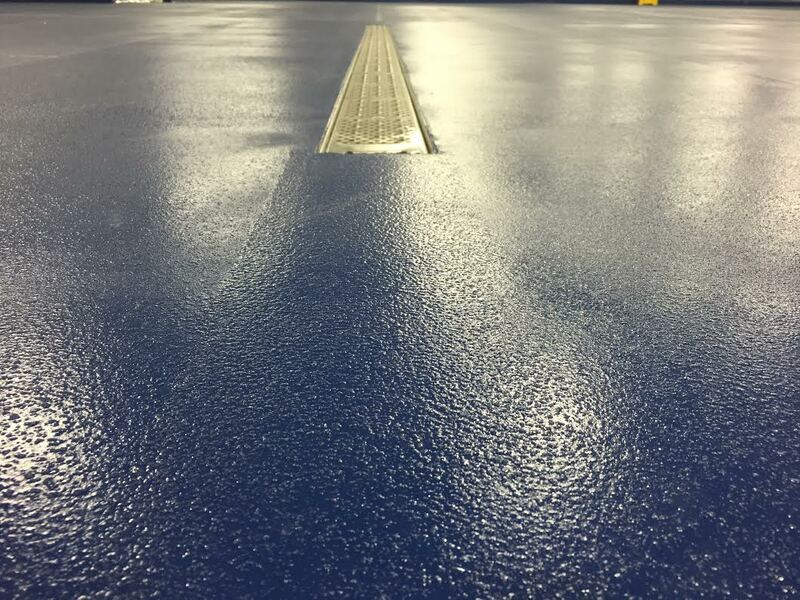 While various types of floors on the market tout slip-resistant surfaces, only a select few can offer fully customized slip-inhibiting properties. Why is this important? Because what one facility considers the perfect level of skid-resistance, another operation may find too highly profiled for optimal cleaning. Floor maintenance routines can differ greatly from one facility to the next for various reasons, based on typical ingredients that might end up on the floor, as well as preferred cleaning products and techniques. 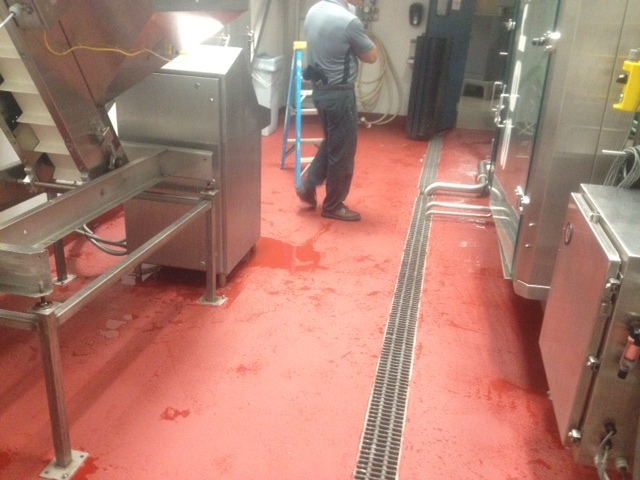 Flooring that can be installed with customized slip-resistance enables commercial kitchen managers to select the right balance between good traction and the ability to properly clean their floor in accordance with their preferred method, whether mop and bucket, automatic scrubber, steam cleaner or pressure washer. Every commercial kitchen floor must be able to withstand exposure to a wide range of varying temperature substances. Ovens, fryers and broilers can spew hot oil and grease onto the floor; pots of boiling liquids get spilled. Granular ingredients such as whole grain flour, sugar, salt and spices can serve as abrasives on the floor surface under foot and cart traffic. Dishes, pans, knives and other kitchen equipment can be dropped onto the floor. Harsh detergents, solvents and de-greasers may be “scrubbed in” during daily cleaning. This type of environment can cause most commercial flooring materials to indent or blister, crack and peel back, exposing the porous concrete substrate underneath. The result can be costly repair and downtime just when you don’t need it. Be sure to select a strong and durable, high performance finish, resistant to hot grease, abrasion, and chemicals. The flooring in a commercial kitchen must be cable of surviving the abrupt and wide divergence in temperatures between the cold of freezers and walk-in coolers and the intense heat of cooker areas, dishwashing stations, steam cleaning and/or hot spray washing. This causes expansion and contraction of both the coating and the concrete substrate. If the surface material and the concrete slab react very different to temperature changes, disbondment and the shearing off of the floor covering from the concrete can occur, creating loose/moving areas of the floor, in addition to enabling contaminants to seep under the surface and into the slab. To avoid these hazards, select a flooring system that is thermal shock resistant – one which expands and contracts at a rate similar to the slab underneath. This helps ensure the entire floor surface remains fully bonded to the concrete, and further, helps circumvent the potential for microbial growth between the flooring and the substrate. There are actually two general sources of moisture in any commercial kitchen. One source is from activities in the room — the humidity generated by the activity of the cooking, dishwashing and cleanup routines, liquid spills and the like. This can of course cause condensation and/or wetness on the floor surface. The other source is a site condition called “moisture vapor transmission” (MVT), stemming either from the concrete itself or from the soil underneath the slab. In both cases, moisture can cause premature deterioration of both the floor covering and the concrete substrate if not properly addressed. Appropriate commercial kitchen flooring is tolerant of ongoing surface moisture produced by daily activities and should also be capable of mitigating any MVT issues if required. While there are various types of commercial and industrial floor coverings on the market that offer some level of benefit to commercial kitchens, there is one category of protective flooring designed specifically for food facility environments that outshines them all: Cementitious urethane. Satisfying all the criteria of the Top Five Requirements above, cementitious urethane mortar floors are an excellent choice in concrete protection for both new and existing commercial kitchen. They offer USDA compliancy along with all the specific design, safety and performance features needed. 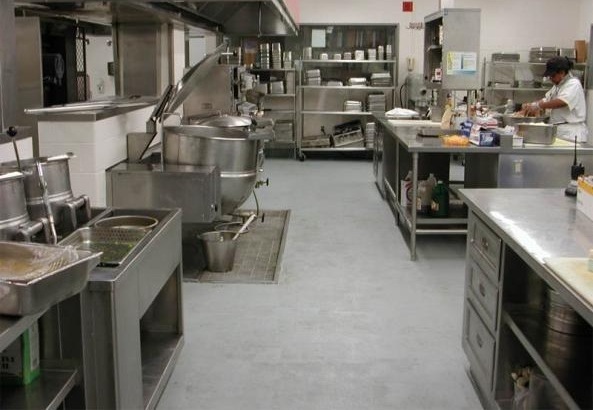 Their outstanding durability, as demonstrated in even the harshest of food facility environments, along with their easy cleaning and maintenance, make cementitious urethane coatings an exceptional commercial kitchen flooring value. 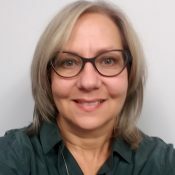 Sophia Daukus is Marketing Communications Manager for Florock Polymer Flooring, manufactured in Chicago, Illinois, U.S.A., since 1952. From manufacturing to food processing, from education to retail and beyond, Florock provides facilities across a broad spectrum of industries with optimal protection and outstanding flooring value.